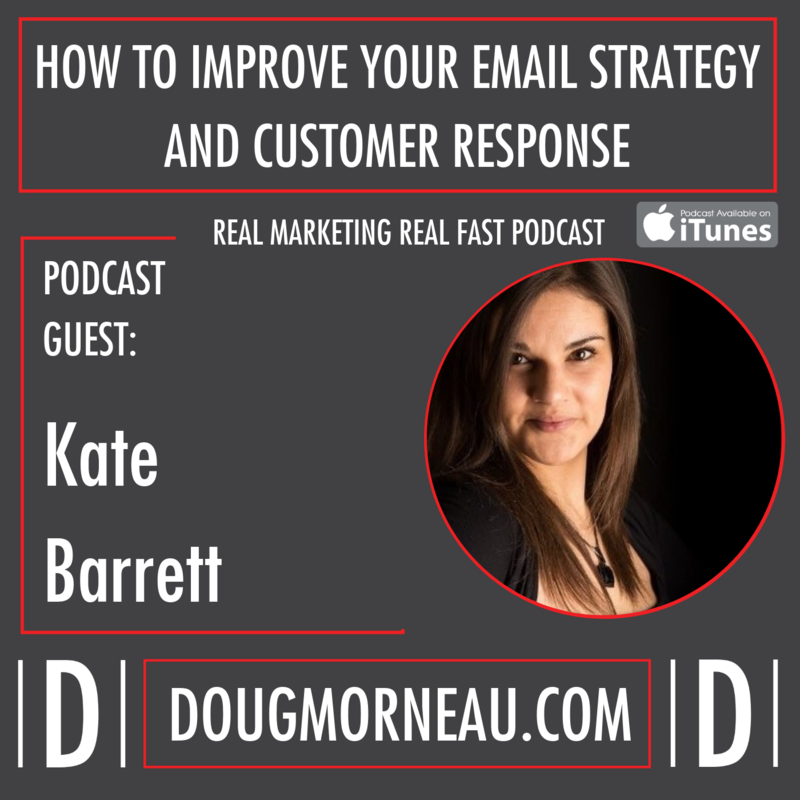 The three big lies of email list rental were that email marketing was dead, that it doesn't work, and that email list rental was illegal. The good news is, email list rental is alive and well, it's a great way to leverage your business, to have massive results in a very short period of time. 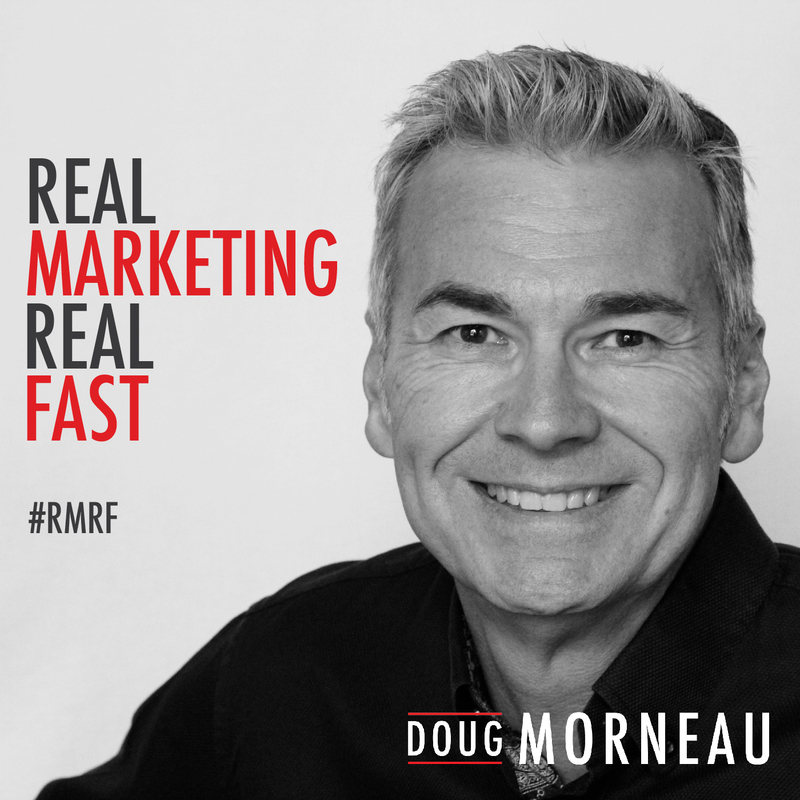 Doug Morneau: Well, welcome back listeners to another episode of Real Marketing, Real Fast. Today's podcast is going to be a solo episode. 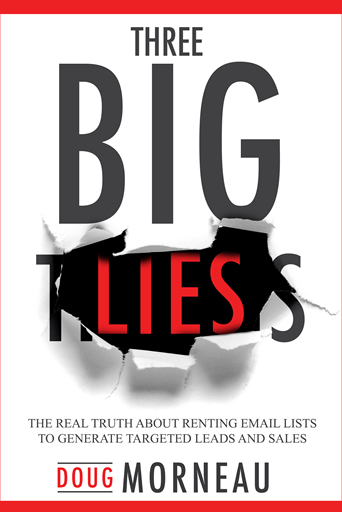 I'm gonna talk about the book Three Big Lies: The Truth About Renting Email Lists to Generate Leads and Sales. So this is a book that I had published last year, became an international bestseller but what I'd like to share with you today are three main points. The back story of the book, how it came to be, a free offer and a juicy story that was not shared in the book, at the suggestion of my editor. Doug Morneau: So my entrepreneurial life began about 33 years ago, and as my business grew and gained some notoriety and success, we had some business challenges you might say, which I'll share a little further along. The comment I kept getting from people over and over again, hey, you have to write a book, you have to write a book, you have to write a book. I got so tired of people saying that I had to write a book. I mean, my wife was telling me that but I heard it from people in the business community, I heard it from friends and I thought nobody really wants to read a book that I'm gonna write, I'm not a writer. But they weren't talking about a business book, they were talking about a biography. For some reason, people found my life story and the challenges that we've had an overcome to be interesting but I just ignored it for years and years and then finally decided okay, maybe I'll write a book. Doug Morneau: I began doing some research and talking to some people about what it would take to write a biography and at one point when I was sharing a brief bit of my story, I had one particular company say, “I think you should skip the book and we should just go right to produce a movie.” That convinced me that maybe the people that were around me and the people that cared for me that was telling me to write a biography might actually be on to something. I did what any good entrepreneur would do, I went online to do some research on how to write a book. Doug Morneau: Through my research, I came across a company in Los Angeles called Best Selling Publisher or BSP, and it's run by a gentleman by the name of Rob Kosberg. I'd done a lot of research and I thought hey, Rob looks like a pretty sharp guy so I bought the course. He had a course that was a “how to”, it was about $800 and I went through the course and I thought Rob is a really smart guy, there are all the resources here how to do this. But quite honestly, I just didn't wanna do it. So I wanted to move on to the next step, and that was could I have Rob's company do all the work and pay him for a “done for you” service? I had received an invitation to go to Los Angeles and I knew full well in advance that I was likely to hire them for their done for service. Doug Morneau: This was May of 2017. I sat through the seminar and the training and I went up and I spoke to them and I said “hey, this is what I'm thinking and wanna write a biography” and I was very shocked by their response. Their suggestion was don't write a biography, that people who write and publish books generally don't make any money selling books. The book is usually used for a lead magnet or a way to attract clients or get speaking engagements to sell something else, but the money's not in the book. Their suggestion was to start with a business book. So having given that some thought and spending some time working with them, I agreed to move forward but with a new strategy. I don't know why I came up with this or where it came from but I thought instead of writing one book, why not write three books? Doug Morneau: Now I just finished telling you that I didn't think that I was a writer and I didn't wanna write a biography, and for some strange reason I got it in my head that I should write three books in 12 months. I signed a contract with them to do that and off I began. The first book was going to be a business book, the second book was going to be around my health and wellness journey and the third book would be the biography. I began writing later that spring and Three Big Lies was born. Doug Morneau: I'll share with you the process of writing, the process of writing was really simple. The way that they set it out was I worked on a title, I'd done some research on Amazon to see what other books were already in the space of email marketing. I bought several of them, I had read them, I looked at the comments from people who had bought the books and then I came up with the title Three Big Lies. Where I got the title from was peoples confusion and the misinformation around email list rental. So that's who the title came to be and the three big lies were that email marketing was dead, that it doesn't work and that email list rental was illegal. None of those were true, I knew that for a fact because every single day I was making money helping my clients to grow their businesses using this exact tactic. Doug Morneau: The process once the title was set was to come up with the chapters and the outline, so I began working with their marketing people there to come up with the outline. We got the outline down and got the book into three basic parts, the first part would be the three big lies that it's dead, it's illegal, it doesn't work. The second book would be some learning, so part number two is email jail doing hard time, talk about account suspensions, talked about your get out of jail free card in terms of email deliverability, leveraging addiction, the addiction that people have to their mobile phones. Finally, part three was moving along and how to execute, so the starving crowd, how to get lightning quick results, stealth marketing and the fact that you could just buy the result that you needed. Then the secret sauce that people didn't know that we could add to the email marketing and the email list rental. Doug Morneau: Once that was set up, the process then moved over to the actual writing and I really didn't know because I had never written before what the process was or how long it should take. So the outline that the folks at BSP suggested was write each chapter like a 30-45 minute Ted Talk and then get on the phone with the editor, present it as if you're speaking. The conversation would be recorded and transcribed and then edited and that would be a completed chapter. At that point I thought hey, that kinda makes sense, I can do that. I asked my editor how many chapters should I do a week. She said that people do whatever they're comfortable with and they can fit in their schedule, so I made a commitment to do a chapter a week and off I went banging away on the keyboard producing a chapter a week. Doug Morneau: It wasn't too long and I had finished the process so the book was then edited, sent back to me and then I got a request from my editor saying hey, I need all the footnotes of all your sources of all the quotes you've got. So there was my first big painful learning experience. I'd been in the business a long time, I had a lot of contacts, I had a lot of information or access to a lot of information so when I wrote the information and presented it, I didn't keep track of the exact sources of some of my quotes and the stats that I produced. I had to go back and do a second run over it and find those attributions so they could be included in the book. That was the process, then the book was completed. After that I worked with the publisher, their design team to come up with the title and then once the cover was done and the book was complete, I actually reached out to a number of my contacts in the email marketing space and the business space and asked them to read and proof the book and give me some feedback, and also to write forewords, testimonials, and endorsements for the book. Doug Morneau: At that point, the book was completed, the book was then uploaded onto Amazon Kindle and the publishers went to work to do what they're supposed to do. I realized that the money for me wasn't gonna be in the book and that I was gonna use the book as a lead magnet and give the book away. I guess there's a couple of thoughts that come to mind for a lot of people when I share this, they go hey, well why would you do that? Why would you give it away? It's not just because I like to be a contrarian, it's because I like to have the success that other people have got. When people ask me for advice, I tell them to find somebody who's willing to pay the price that you're willing to pay or has done what you want to do. So I went looking for people who had gone through this process with Rob and his company and I noticed there was a number of them out there that were making high six figures and seven-figure incomes giving their book away and using it as a lead magnet. Doug Morneau: For me, that wasn't a big deal to have invested the money and get that out the door. The goal was to use the book to create authority for me in the space, to share the email list rental topic that wasn't talked about, and still isn't talked about, and get speaking engagements. While I was at an email marketing conference in Las Vegas in the spring of 2018, I had stepped out of a session and I received a note from somebody congratulating me on becoming an international bestseller. This was kind of interesting because I knew the book had loaded to Amazon, I didn't know the publisher had started promoting it and while I was out of town at an email marketing conference the book became an international best seller in Canada, the U.S., the U.K., and Australia, so that was pretty exciting. Doug Morneau: During the time while I was writing the book, I began thinking of ways that I could strategize, ways I could start to use the book to get out and start sharing what I considered the good news. The good news was hey, email list rental is alive and well, it's a great way to leverage your business, to have massive results in a very short period of time. I started responding to requests for speakers at conferences while I was completing the book and just after it was published. What came as a very big surprise to me was that the email marketing industry itself, the industry conferences didn't wanna have any part of me speaking and especially speaking on this topic. Doug Morneau: To be quite honest, I just frankly couldn't understand why not and so here I sit today recording this episode and I still don't understand why not other than that's just the reality. So I'm just gonna share with you one response that I received from a software as a service company called Litmus, it was a tool that I used to use to do email design. Their response was, “Hey Doug, list rental's a topic we hear about frequently and we've included in our research, as you noted, however, we discourage the practice of list rental. Our position is that permission cannot be borrowed or sold and that consent is defined by regulations like CASL and GDPR is critical in the email channel.” I got this response back and I'm thinking let me see, this is a software as a service vendor so someone who has a tool that allows you to design email and has email marketing conferences and they discourage list rental and their understanding is that … or their position is that you can't borrow permission. Doug Morneau: So I'm just gonna go off on a quick little tangent here, I do promise to come back and tell you why I think the approach is wrong. The publishers that I work with are all big name brand publishers, so go any magazine store that you would frequent, look at all the topics on business, marketing, and sports and all the health and wellness, fitness … almost all of those publishers will allow you to rent their email list. We're not talking about fringe stuff, weird stuff. I'm not talking about buying email. So I literally couldn't get my head around why the response was you can't borrow permission and it's outside of the CASL and GDPR. Doug Morneau: Enough on that, what became obvious to me was that those people that were hosting email events didn't want this message shared to their audience. Let's be honest, I thought that was a great opportunity and it was a good opportunity for them to show a different point of view and a different opportunity, but it's their conference. They get to choose who they have for speakers and I just didn't make the cut of what they're looking for. As I mentioned earlier, the long term plan really was to do free plus shipping and it's funny when you say that 'cause some people say well why should I pay for shipping? As if a publisher or a writer giving away a book isn't good enough that often the pushback is that people don't wanna pay for shipping. Well, quite simply if you're a fan of Ryan Deiss, he calls it a trip wire. You can call it whatever you want but I call it a qualifying process if you're not willing to pay the seven or eight dollars for shipping and handling then I'm not willing to send you the book. Doug Morneau: In terms of my investment, if you wanna know how this worked out and what it took to do this, the investment to buy the first course from Rob was about $800. The done for you service was $22,000, and that doesn't obviously include my time, I'm not looking to charge for my time. So I'm basically in this for about $23,000 before I sell a single book. So I figured if I'm willing to also pay to have the book printed, the least people can do is pay for shipping and that will tell me if you're serious and you're interested and you're a perspective prospect, client or somebody that we may work within the future opposed to just sending out a whole bunch of books to people who quite frankly won't take the time to read them. Doug Morneau: Having started the process of the free plus shipping, the next step is how are we going to monetize this? Well, the next step for me is to offer an in-depth training course to teach you how to find the best email lists, how to rent the email list that works best for your business and what's required from your creative team, what's required from tracking? And what are the techniques and the analytics and the reporting? And how do you scale up and how do you leverage the new media tools that amplify your email list rental efforts? Then finally, what are the joint venture opportunities? So how can you identify potential partners that will email your marketing message to their list and do it on a revenue share basis? So that's basically the outline of the course that I'm working through as I record this episode. Doug Morneau: So what happened during this process is a little bit of self-doubt starts to creep in, my original thinking was that I should charge $997 U.S. for the course. Through a process of a few weeks, as I'm writing the course, the self-doubt creeps in and had me thinking well, maybe I should start at $97 just to see how this is gonna work. And once I got over myself had done some research and talked to the folks at Thinkific, who I'm working within Vancouver, the beautiful city I live in, decided to launch the course at $495. Doug Morneau: So entrepreneurs, here we are talking about a course that's not complete, I'm a guest on somebody else's podcast and what's the first thought that runs through your mind when you're sharing with somebody what you're planning on and what you're doing and they say, “I'll buy that”? Well, my first thought was, well I guess I should say yes. I said, “Okay, so how do you wanna proceed?” He said, “Well let me give you my credit card number now but I want you to promise me you'll process the card today.” I said “okay,” so I took down his credit card information and with a promise to process the payment later that day and he says,” Now that I paid for the course, I wanna tell you your course is way too inexpensive. The information that you're sharing, that you shared with me, you should be charging over a thousand dollars for.” So good for Tom, he took immediate action. Good for me, that was a first sale I made on a course that wasn't done yet. I told him it wasn't done but he didn't seem to care, he thought there was enough value there and so I made my first sale for $495. Doug Morneau: So I went back and revised my plan, well if I can pre-sell a course that's not done for $495 then I'll do my soft launch at $495 and then move the price to $997 with the goal of maybe eventually moving the course up to about a $3,000 price point. So that's the monetization strategy for the followup of my book. I did complete my second book, my health and wellness book in January 2018, it is my life … my health journey. It's called Prescribed to Death, How I Got Off Five Medications and Saved My Life and it walks through the process of how I nearly died, talks about the five statin drugs that I was on and had been on for 20 years and how I managed to figure out how to get off of these drugs within 12 months. Doug Morneau: I am now writing book number three, so remember I said that when I went down to Los Angeles to meet with Rob and the folks at BSP, I started with the idea of writing a biography and left agreeing to write three books. The business book, the health book and the biography. So book number three is the good, the bad, the ugly, the salacious and the scandalous biography. I really don't have a date for this, it's obviously a lot harder write … talking about your life and the good things and the bad things and the people that have come and gone and all the stuff that happened in between than writing a book about business or your health's journey. Doug Morneau: Now let's get back to … I did tease you at the very beginning and I said I was gonna share a story with you that was not included in my original book, The Three Big Lies, and so here it is. Let me give you a little background, my business was growing and I was working away and my first goal was to get to seven figures and once I got to seven figures, if you guys know me at all and you listen to me and follow my goals, I went hey, I got to a million a year, let's go to two million a year. I got to two million a year and I said hey, let's go to five million a year. So I got the business to five million a year, I said hey, I got to five million a year, let's double it again, let's go to 10 million dollars a year and I got to 10 million dollars a year in sales and said well hey, a million dollars a month, that's a new goal. So we got to a million dollars a month and we kept proceeding along until we hit our biggest year of all and we reached 16 million dollars a year. Doug Morneau: Well, admittedly I was thinking of growing my business and thinking of growing my clients' business and I didn't have any concern or any thought to how this might affect my competitors because, to be honest, I really didn't care. But that didn't go over very well, it didn't take very long before we were working on a project and I started getting some weird phone calls to my office and basically, they were extortion phone calls and they became increasingly more threatening. Then they went from just my office and they started coming to my home and then they started coming to my cell phone and so I started recording them and tracking the numbers and I think the people who were phoning and harassing us trying to get me to scale down my business and stop doing what was I was doing must have figured out that I was tracking the calls because then they started spoofing the numbers. So I started getting calls that looked like they were coming from the FBI or coming from the White House or coming from really weird places. Doug Morneau: That level of intimidation just continued until I finally went to our local authorities. In Canada, I went to the RCMP and I say “hey, there's the issue” and they said, “hey, don't pay these people, they're likely thugs, they're just trying to intimidate you and extort money.” But then the calls got increasingly more threatening so we ended up hiring a security company who came in and put break-proof glass on our house and put new tamper-proof locks at our house, we set up new security protocol at our office, we had to start running shifts from our offices having our staff come and go at different times, start working from home, start working remotely and then the threat got to a level where they felt that personal protection was in order. So I basically had a personal guard that sat in front of my house seven days a week, 24 hours a day with a vehicle running and they just took shifts. Our family had radios, we had a safe room set up in the house, they wanted me to wear a flak vest and whenever I went out we had people that … we had security follow us. They wanted us to put our cars away, to rent different cars, take different routes back and forth from home. Doug Morneau: Then this finally came to a head when one of our staff with a keen eye recognized an unusual vehicle that had pulled up in front of the office and so they phoned and reported it to the police and it turned out that it was a vehicle that was rented in Alberta. So two gang-type thugs had hopped on planes from two different places in the U.S., had flown into the Calgary airport, had rented a car and had driven to the Vancouver area I guess to visit me to reinforce the message that I was affecting the business of one of my competitors. So that was my juicy story that didn't make it in the book. I don't know how relevant it is to what you're doing or what you might think of the work that I've done, but what it did show to me as we were obviously having a lot of success in a space that people kept saying didn't work, was dead and was illegal. 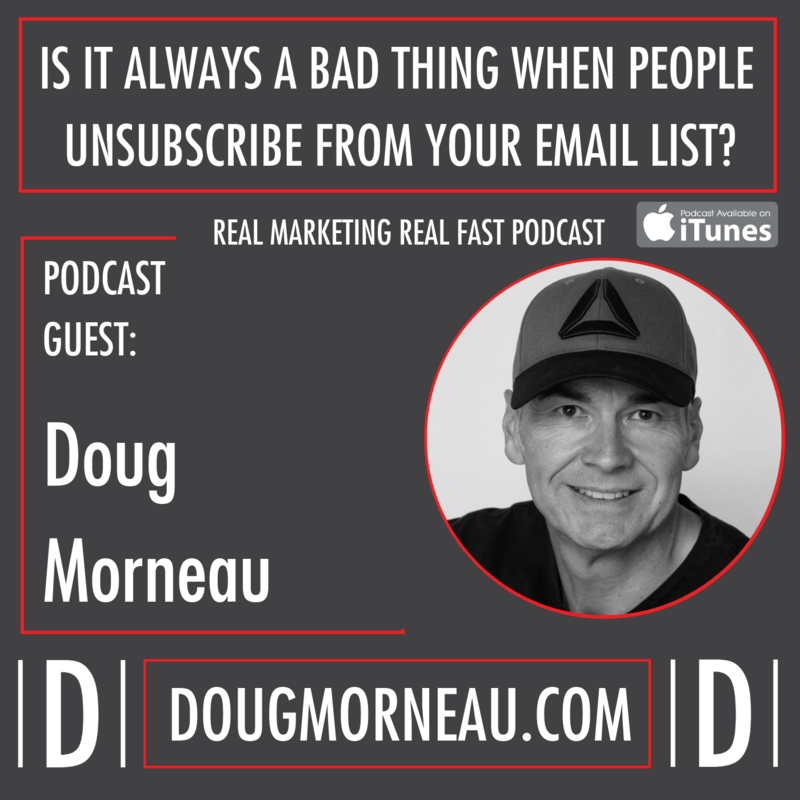 Doug Morneau: So there's my story, there's the back story, the good, the bad, the ugly that happened as I was growing my email list rental business. Who would've thought that growing a business like this would've come up with intimidation from the mob? So will email list rental still continue to produce staggering results in a tsunami of leads for sales in ever? I don't know, it may, I mean it's working now. The one thing I do know for now is that I focus on what works and I focused what worked in the past and still paying dividends today. And when I say the past I'm not talking about some past life that's two, three, four, five, 10, 15 years ago, I'm talking about weeks or months ago and as I record this episode today I'm currently working on the strategy for two marketing campaigns that are heavily focused on using email list rental as the cornerstone to do the heavy lifting. In addition to that, our team will obviously use ad words, use retargeting and social media to help leverage and drive this campaign home for my clients. 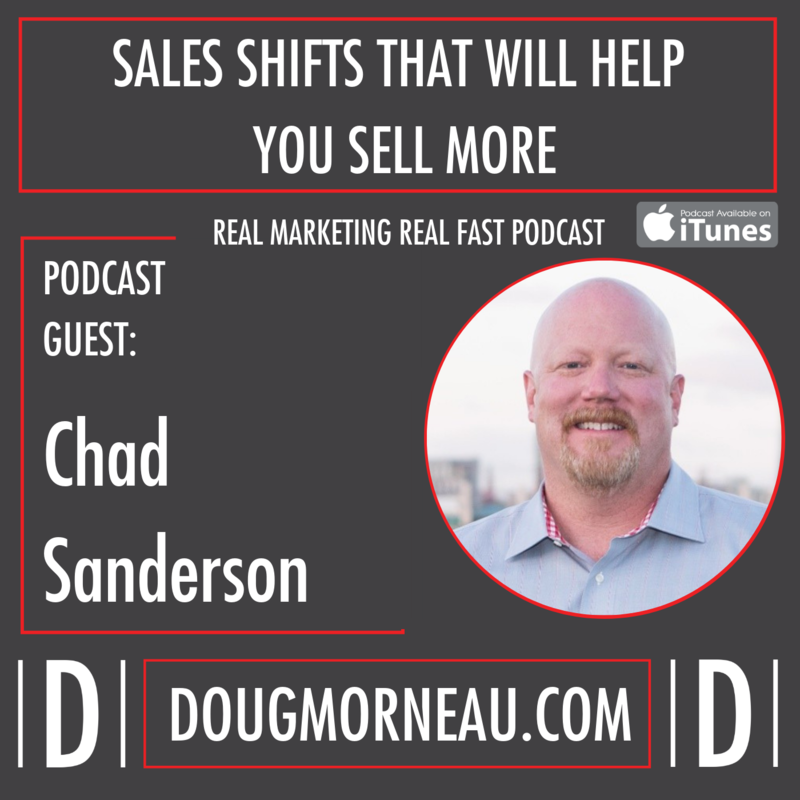 Doug Morneau: So in closing today, I just wanna say it doesn't really matter whether you're a solopreneur, whether you own a small business, big business or you're in charge of sales and marketing for your employer, without leads you're dead. And my recommendation to you is at least investigate the potential of renting email lists to add to your media mix to grow your business. My free offer, I did say I'd have a free offer for you, and this is my free offer and it shouldn't come as a surprise what that might be, if you go to DougMorneau.com and sign up for the real marketing email, I will notify you when I launch the free plus shipping offer. You'll be the first one to get an email if you're on the list, then when you receive the email it's up to you. You can decide to accept my offer or reject my gift at that point. At that point if you want to accept it, you're just going to click through to a landing page, you're going to put in your payment and shipping information, you're going to pay for the shipping and I'm going to ship you the book. Doug Morneau: So I hope that this episode gave you a little background and maybe a bit of encouragement around at writing from somebody who had never written much at all to now having written and completed two books and now having one as a bestseller and I anticipate that the second and third book will be bestsellers as well. So wishing you huge success, massive gains and profits and I look forward to serving you on our next episode.